I've been having a lot of fun recording all of my musician friends, especially the Pommersche Tanzdeel Freistadt, using the three configurations shown here (small, medium, and large). They represent a mix of professional and amateur gear that works well together, and gives great results. This is the setup I use for unobtrusive, on-the-spot recording. It will run on batteries or AC power, and records up to 74 minutes of CD-quality stereo on a minidisc. Fresh alkaline batteries will record for about 7.5 hours. I often use lithium batteries due to their light weight, and because they can double the recording time. Unfortunately, they don't allow correct readings on the front panel battery life indicator. The Sharp recorder accepts mic, line, or fiber optic inputs. It doesn't have an automatic level control, so I have to set the record level manually. I've noticed that when I change the input level beyond a certain point, the inputs are muted for about a second. When I'm recording, that means a one second gap in the signal, which I try to avoid! The Sony microphone seems to pick up exactly what I'm hearing wherever I place it. Use of mid-side technology gives it a variable pattern which can be set for 90° or 120° spread. The Optimus headphones are actually made by Koss, and have tremendous bass response. The Sharp recorder has a bass boost feature, but with these headphones I don't need to use it. Here is the setup I use for modest live situations, where I have some time and room to set up a small table of equipment. 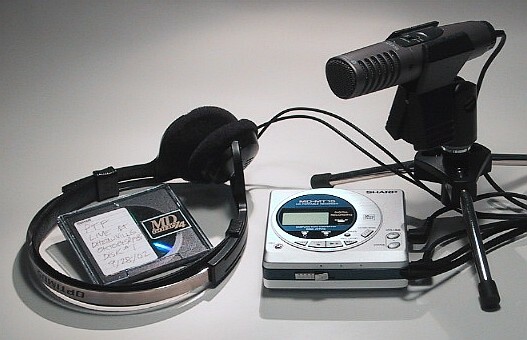 The mixer accepts two mic and two line inputs, and sends a stereo audio bit stream to the minidisc recorder over a fiber optic link. Using a fiber optic link allows me to remain in the digital domain when recording, which has some neat advantages. I don't have to set any levels on the minidisc recorder, since dynamic range is established in the mixer and is unaffected by the recorder. The recorder and the connections to it then make no contribution to system noise or distortion. Note however that consumer grade digital recorders set a flag bit in the data stream when recording from a digital source. This bit is then used to prevent the recorder from making second generation digital copies1. This isn't an issue for me since I do most of my post-production in AudioDesk, described below. One quirk of the Fostex mixer is that its internal circuits are powered from a single ended 5 Volt supply, which limits the maximum input signal to around 1.3 Volts AC. I occasionally run into sources that exceed this, which have to be reduced with an external passive attenuator. This is my large scale setup, which can record 8 tracks direct to hard disc, while playing 8 other tracks at the same time. The total number of tracks in a project is only limited by available disc space. The MOTU 828 has 8 balanced line inputs and 8 balanced line outputs, which interface well with professional mixing consoles like the Mackie 1604-VLZ. This makes it easy to set up for multi-track recording with the same equipment you would use for live sound. I also use the MOTU 828 to transfer stereo audio bit streams to and from my hard drive via fiber optic link. This works with both of my minidisc recorders, and the Fostex digital mixer. The MOTU however doesn't automatically select the clock source, so I have to remember to check the setting manually. The MOTU has two mic level inputs, but they have too much hum to be of much use. 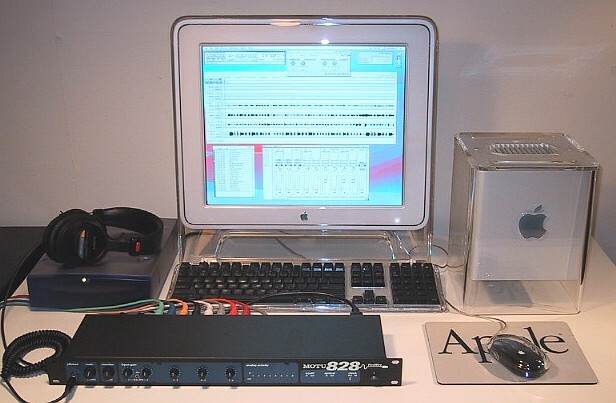 I use AudioDesk software, which comes with the MOTU 828, and is	a full-featured digital audio workstation program for the Macintosh. T. Giesberts, "DASP-2002 Digital Audio Signal Processor", AudioXpress September 2002, p. 4.